The options for farmers to market their products locally are growing! Where do you start? What option will work best for you? 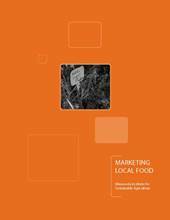 Marketing Local Food is a handbook designed to help Minnesota farmers explore the various options for marketing local food. It introduces the basics of different marketing systems, suggests resources and includes profiles of farmers who are selling farm products directly to consumers via farmers' markets, roadside stands, CSAs, on-farm stores; as well as information and profiles about selling indirectly via retail food establishments or food services. This project was coordinated by MISA and developed with contributions from a team of experienced farmers, personnel from Minnesota nonprofit organizations, the Minnesota Department of Agriculture, and University of Minnesota researchers and Extension educators. Funding for this publication was provided by the Minnesota State Legislature, the USDA Risk Management Agency, and North Central Region Sustainable Agriculture Research and Education Program. Note on printing: You are welcome to download, print, and distribute any portion of this publication, giving credit to MISA. However, some people have had problems with printing large segments of the document. If you need copies of more than a few pages, consider requesting a free print version of the book from the MISA office. "This publication was coordinated by MISA and developed with contributions from a team of experienced farmers, personnel from Minnesota nonprofit organizations, the Minnesota Department of Agriculture, and University of Minnesota researchers and Extension educators. Funding for this publication was provided by the Minnesota State Legislature, the USDA Risk Management Agency, and North Central Region Sustainable Agriculture Research and Education Program."